There will be a live chat in the CB during all the races. Hope you can join us! Love this idea...can't wait for the season to start. kahnegirl wrote: Love this idea...can't wait for the season to start. I wasn't home for the shootout, I went to a friend's house to watch it, but I am going nowhere for the 500. I plan on being here in the CB. I hope you all can make it. I am seriously considering taking a PTO day Thursday. If my tax check comes in when it is supposed to, I am buying me & pappaw a flat screen to watch the 500 on. luckyGordongrl wrote: I am seriously considering taking a PTO day Thursday. If my tax check comes in when it is supposed to, I am buying me & pappaw a flat screen to watch the 500 on. That sounds really nice! My vacation starts on Thursday, so I'm going to be home all day! Those 125's shuold be really good! I think I need to pull a sicky on Thursday so I can watch the Duels. I'm taking half the day off so, I can be home to watch. 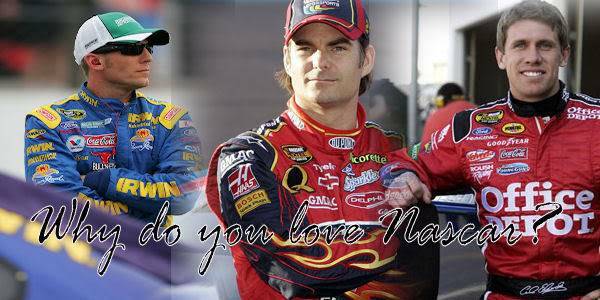 kahnegirl wrote: I think I need to pull a sicky on Thursday so I can watch the Duels. That is a bummer! Glad you're ok and can still watch the race though. Sorry to hear that LG! All right ... Are we gonna do this people? I will be here all day Sunday, who's with me? luckyGordongrl wrote: All right ... Are we gonna do this people? I will be here all day Sunday, who's with me? I'm never on till night. Cooooooommmmmmmme to the Chat Box!! !